The master designer earning the approval of floral enthusiasts everywhere doesn't keep his lack of a pedigree a secret. "I've never been to floral school," said BJ Dyer, who graduated from the University of Denver with a degree in business. In town for a presentation at the Honolulu Academy of Arts, Dyer said he segued into floral design. A former caterer, Dyer used to idly construct arrangements out of petals the florists left behind at events. Dyer's destiny changed when he became a silent partner in the company Bouquets in 1988, then owned by Guenther Vogt. Dyer and Vogt are now co-owners of the European-themed floral service shop, with three locations in Colorado and annual sales exceeding $1 million. The two have received several "best-of" awards in their state, as well as an industry ICON award for best floral design in 2006. Bouquets has been named one of the nation's Top 10 florists by Bon Appetit Magazine and was selected as national runner-up Retail Florist of the Year by Florists' Review Magazine in 2003 and 2004. 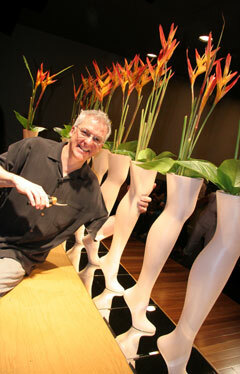 BJ Dyer, owner of Bouquets in Colorado, is known for his sculptural arrangements using exotic flowers. Window vases in varied heights are used to emphasize positive and negative space, top. The glass itself provides another point of interest. Dyer and Vogt routinely give design presentations throughout Colorado, and are slowly expanding to other states. "The more I share, the more I get back," said Dyer. "Ideas are free." The silence as Dyer worked was an indication of the capacity crowd's reverence, as 100-plus pairs of eyeballs were glued to his fluid motions, quickly assembling 13 arrangements in the Doris Duke Theatre. The buzzing that arose between segments was a sure sign of respect. "When I hear people talking, it's either really good or bad," Dyer said. Judging by the oohs and aahs, Dyer's end results created went far beyond "really good." The Garden Club of Honolulu brought Dyer to town for workshops and this public presentation on new trends in floral design. "Dyer is a very engaging personality and very creative," said Lynn Murray, first vice president of the club. "He is recognized internationally but also is just fun. Sometimes enthusiasts can get bogged down in competition, but Dyer has fun while following all the principles." 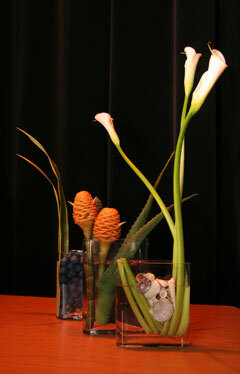 Known for his sculptural arrangements, Dyer used island blossoms and a few imported materials. What's fresh in floral design? From Dyer's perspective, abstract arrangements made from blooms, netting and wire -- in particular, using chicken netting as a mat to weave in fresh flowers and plant materials. 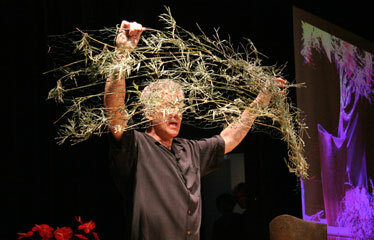 Dyer holds bamboo to use as a mat for anchoring flowers. Also getting applause: thin window vases of varying heights, made all the more spectacular for playing up positive and negative space. The '80s and '90s were all about natural organics, said Dyer. "People get tired of it. What's very in is adding things that are man-made contrast." One of his trademarks is a grapevine orb used to hold flowers. As part of his avant-garde look, part of the skeletal structure remains exposed. "The grapevine as an armature is in vogue, but 15 years ago it was an accessory and disappeared (underneath the arrangement)." Dyer's preparation for the presentation included a trip with Murray to the botanical gardens at the Lyon Arboretum. "Some of the materials were rare to me," said Dyer, noting shell ginger and moa. To work with them in such quantity was a luxury, he said. "I worked with shell ginger occasionally. It's so fragile, so exquisite." The Honolulu visit came about after a presentation Dyer made last May at the 93rd annual conference of the Garden Club of America, wowing the 600 in attendance. He was booked shortly afterward by the Honolulu branch and five other clubs in California, Tennessee and Maryland. Out-of-state demonstrations will become part of Dyer and Vogt's yearly schedule, and should an admirer pick up a cue from them, Dyer feels that imitation really is the sincerest form of flattery. "It's really the biggest compliment for me personally to hear another stage presentation, and it's something that myself or someone showed someone else," said Dyer. "It's like leaving some sort of legacy. That's exciting." He said with a laugh, "Florists are great thieves." 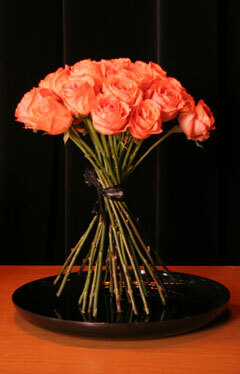 Stems of a European spiral design of roses are crisscrossed and tightly bound so that the bouquet is able to stand on its own.